This past week my friend G, a cellist, came to visit and offered us free tickets to a benefit concert she was playing in at Carnegie Hall. But Thom said, “Sure, we’ll go,” because apparently, Thom likes classical music. What Thom doesn’t like are the long speeches that always take place at these benefit concerts before the music starts. Thom saying things like this ought to make me, a woman, worried, but it doesn’t. 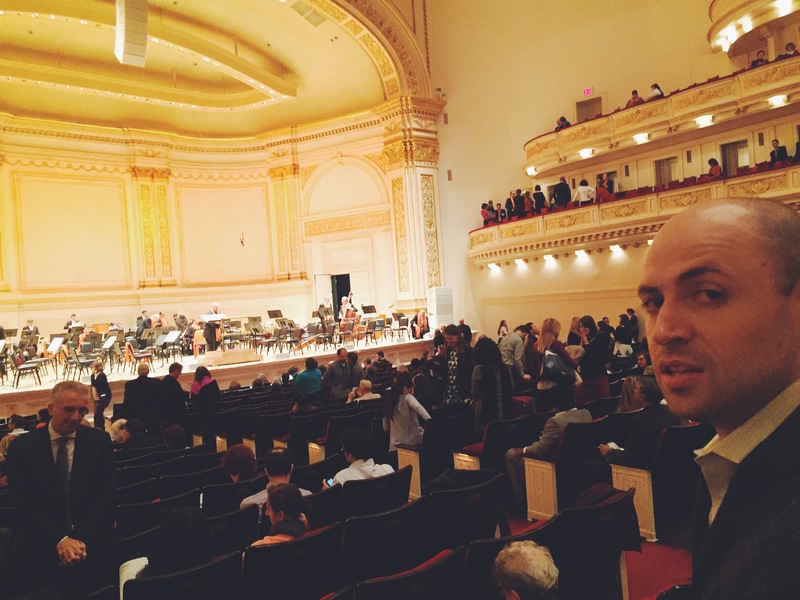 As the orchestra readied itself, a man two rows in front of us had piled a heap of outerwear on the back of the empty seat next to him, inadvertently blocking the view of an elderly woman behind them, her line of sight passing just barely over the top of the seats. Embarrassed, the man quickly took his coats down and turned to give the woman an apologetic smile. She nodded back and gave him a little wave, and Thom leaned towards me, the ire he had toward the speakers gone. Thom binge-read this week and finished The Dark Forest in record time, which is unfortunate since book 3, Death’s End, doesn’t come out until April 2016. Thom sat around looking despondent. “Betty,” he said, “I need a new book to read.” A few days later, The Great Rebalancing by Michael Pettis arrived via Amazon, but by then he had already started Ready Player One. In his quest to update his fall – and now fast-approaching winter – wardrobe, Thom stopped by the incredible sale at Ben Sherman in SoHo (full priced online) and picked up new pants, striped socks and this blue polo. As I was writing the above, Thom groaned, “Why are you writing about all the pants I buy? People will start stealing my style.” Then, “Oh my god, are you now incorporating my complaints about the blog into the blog?” I nodded. This, ladies and gentlemen, is called meta-complaining. Thom also complains when I wear his clothes. “You need to stop dressing like a man,” Thom says. And he hates when I wear his hats. Other guys, I pointed out, seem to find it adorable when their girlfriends wear their clothes. And now, it’s Thursday evening** and Thom, having read this interesting article in the Financial Times in which Spectre, the fictional global criminal syndicate in the Bond series is compared to modern-day VC firms (spoiler alert: they aren’t that different) suggested we watch a Bond film this evening with our dinner, a large pizza from his neighborhood favorite, Merilu Pizza Al Metro. Hey Betty, nice Thom post (though I also agree the Betty-thought posts are equally important!). One thing: I wish it had said what the music pieces were, who the composer was etc! Ah excellent point! The program that night: Ravel’s Shéhérazade, and Rimsky-Korsakov’s Scheherazade!